If you have a single stage heating or cooling system, your furnace and air conditioner has only a single level of heat or cold output. These types of systems are most popular in areas where there are extreme weather conditions – such as very cold winters and hot and humid seasons. They are designed to provide the most comfort possible in these drastic weather conditions; however, this also means that the HVAC unit is running at full capacity for the most part, even when its not actually necessary or needed. This leads us to multi-stage heating and cooling systems. With multi-stage, you can vary the output of cold or heat. If you don’t live in an area with extreme weather conditions, but on certain days experience weather where you might need a little more cooling or a little more heat, you can adjust the output to match what is actually needed and this saves you money. Zoned HVAC systems are heating and cooling units that are able to heat or cool separate parts of your home, aka”zones”. With this type of system there are zone valves or zone dampers inside the ductwork that you are able to control. By dividing your house into zones, you can drastically cut down your energy costs as you are only using the heating or cooling where it is needed. Why cool a zone in your house that is infrequently used? Humidifiers and dehumidifiers are a necessity if you live is a dry or very humid climate. With zoned HVAC units, you are able to bring the humidity up or down to 50%, controlling the level of humidity in your home. According to the EPA, some of the biggest threats to indoor air quality stem from moisture issues. If humidity levels in the home are not properly maintained, a plethora of hazards become abundant. Unfortunately, with forced-water heating systems, you cannot use humidifier and dehumidifier units. If a humidifier or dehumidifier unit is installed into the air conditioning or furnace, you have to turn the system on in order to control the humidity levels. The other option is to install separate humidifier/dehumidifier systems that you can control separately from you heating and cooling system. Furnaces delivers heated air via ductwork and normally function on natural gas or propane for fuel, but all-electric furnaces are used too. A boiler is used as the heat source for a forced water heating system and the heated water is then delivered across the house either by circulator pumps or zone valves. You can also use electric heat pumps instead of using furnaces and forced water systems to either heat or cool different parts of your home. A heat pump can be used to reduce costs if you feel like your furnace is using too much fuel. There are also hydronic heating systems or radiant floor heating units that involve installing pipes beneath the floor. A glycol solution or water is pumped into flexible tubes which then heat the floor. In order to use a hydronic heating system, a boiler or heat pump is required in order for it to work. 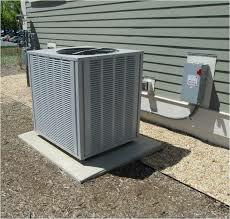 A window AC unit is the most commonly used air conditioner for single rooms. Components that make the window air conditioner work (the condenser, compressor, cooling coil and expansion valve) are all contained in one box and is typically installed on a windowsill, as its name suggests. The mini-split air conditioner is comprised of 2 parts – an outdoor unit and an indoor unit. Indoor air handlers are mounted on the wall, ceiling or floor and this system is also capable of having multiple zones throughout the home. Contrary to a window AC unit, a wall slot is not required for installation, rather they only require a small hole through the wall where the copper line set is run and can be used to cool more than one room at a time, separately. This type of air conditioner is best used for cooling large spaces in an office or in a home. The whole unite is outside and connected to the ductwork that runs through the building. The most versatile system, central air-conditioning systems can be used to cool various spaces such as entire hotels, offices, gyms, factories, movie theaters as well as houses. Included in the central AC system is one large compressor that is capable of producing tons of cool air. Regardless of the HVAC system you have installed in your home, it is important that every unit has a quality filter that fits correctly. Doing so ensures your indoor air is clean and your unit is running at maximum efficiency. Changing the filter in your HVAC system is as important as changing the oil in your car and, US Home Filter makes filters that fit all AC/HVAC units! We can supply you with the best and most efficient HVAC filter available from standard to custom air filters, to whole-house filters, grille filters and humidifier filters, we’ve got you covered! Order Now and Receive FREE SHIPPING on Your Order! Selecting the filters that are just right for your home can be difficult and confusing at times. At US Home Filter we understand this, which is why our experienced staff is here to help answer any questions you may have. If you need personal assistance with selecting the right air filter for your needs, contact us now online or call us at (855) 237-1673. We want to earn your business and we guarantee your satisfaction! Take advantage of our quality products, vast selection, low prices, and enjoy FREE SHIPPING on every air filter order within the Contiguous USA. © U.S. Home Filter 2018. All rights reserved.